In my last post, I shared the disastrous results of improperly venting a bathroom exhaust fan. We were adding warm, moist air into the attic, but it wasn’t leaving. The attic ventilation was not functioning as designed. A well vented attic is an important part of keeping your house in good condition. This isn’t my house, but it does illustrate a couple of ways to provide good ventilation in an attic. It has both large triangular vents in the front gables and a continuous ridge vent. Although you can’t see them, most likely there are vents in the soffit, and the attic ventilation works as it should. According to conventional wisdom, there are several reasons for attic ventilation. Ventilation reduces heat buildup in the attic in summer. This keeps the attic cooler and reduces cooling bills. In cold weather locations, ventilation reduces ice dams on the roof. Additionally, proper ventilation will prevent condensation and mold growth. Warm and moist air from the living space migrates through the attic and out through the roof. But, the most commonly cited reason is to extend roof shingle life and meet roof manufacturer warranty requirements. 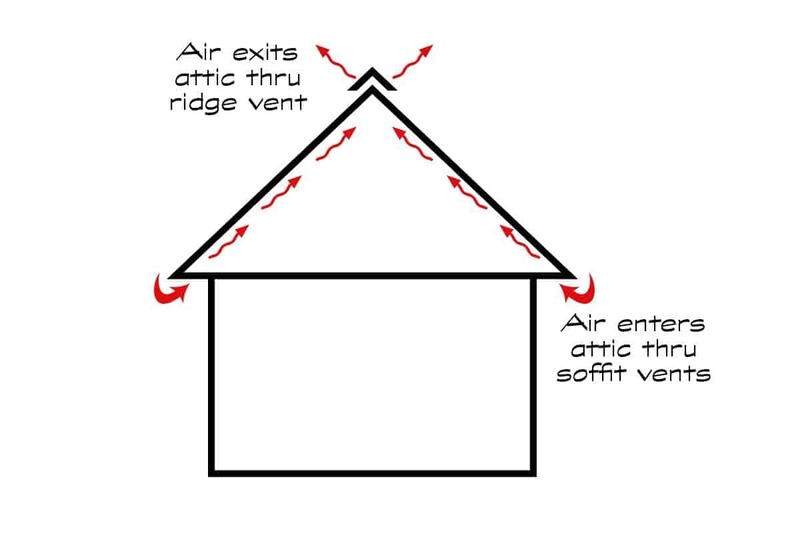 The diagram below is a rudimentary explanation of attic ventilation. Proper attic ventilation uses the principle that hot air rises. Air intake vents are located down low at the soffit line. Warm air exits the attic through vents located higher up. Higher vents can be a continuous ridge vent (part of the roofing), a gable vent located high on a wall, or roof exhaust fans (either passive or powered). Most locations in the United States have adopted the International Residential Code (IRC). 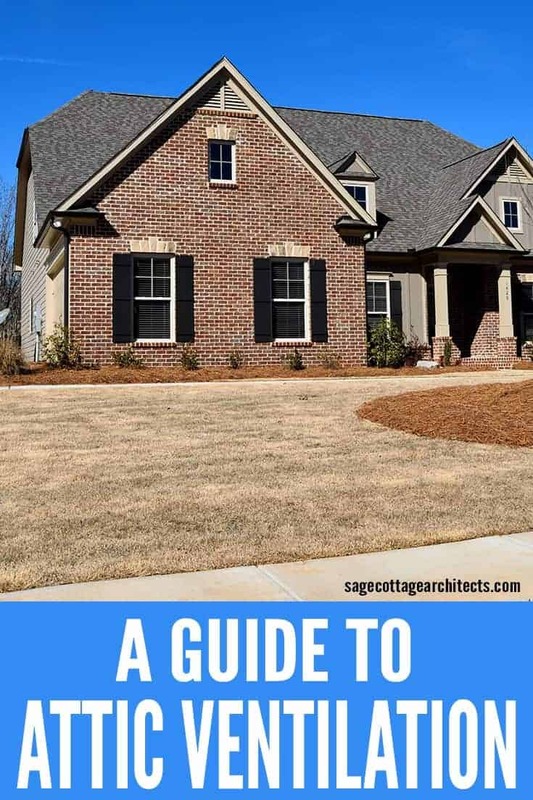 However, local building departments determine which edition to adopt and any modifications. This post discusses attic ventilation in broad terms. Always check with your local building officials for your particular situation and code compliance. They have the final say. Does my attic need ventilation? Not all attics need to be vented. Some attics are designed to be conditioned space. But as a general rule, building codes require most homes to have attic ventilation. If you have insulation on top of your ceiling and not on the underside of the roof, then you probably need to ventilate the attic. How much ventilation is needed in an attic? Determining the amount of ventilation is a relatively easy process. First, calculate the amount of required ventilation and then select products that meet those requirements. Most building codes require dividing the area of the roof by 150 SF, but some use 300 SF (be sure to check local codes). One half of the ventilation needs to be located at the lower point of the roof and one half at a higher point. Some jurisdictions require higher vents to be at least 3′ above the lower vents, so again, be sure to check local codes. Now choose products that meet the requirements. 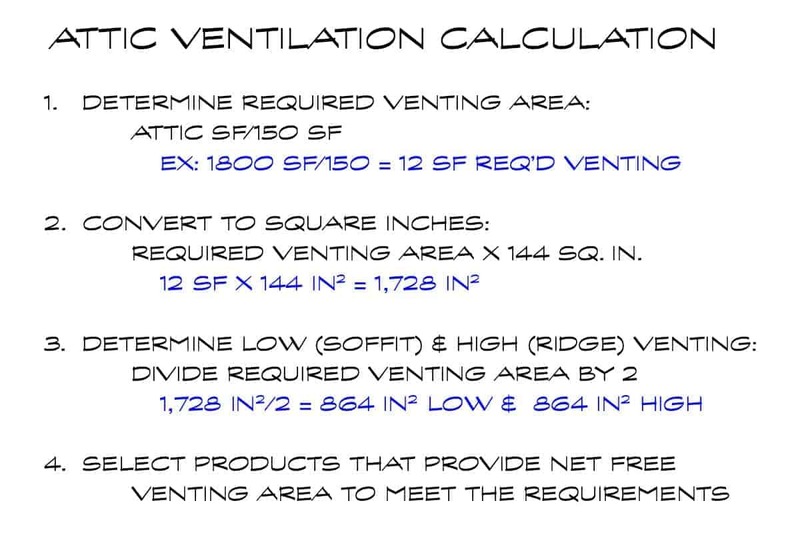 Most vent products list the Net Free Venting Area (NVFA), usually in square inches, as part of the product description. Select enough venting that the NFVA exceeds the required amount. There are several different building products designed for attic ventilation. Soffits are typically vented with something like this Ply Gem Vented Soffit. 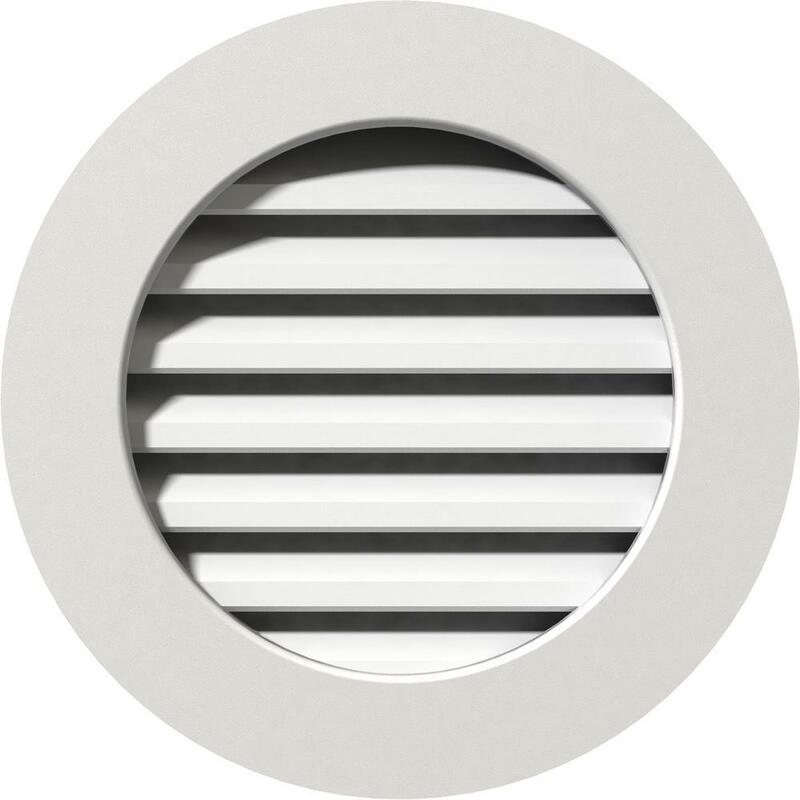 The higher ventilation requirement can be accomplished with a wall vent like this Ekena Millwork Round Vent. 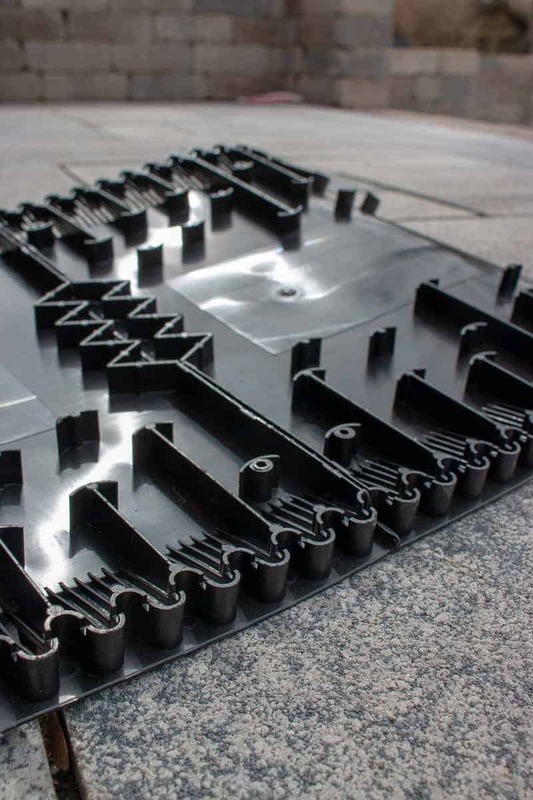 A continuous ridge vent is one of the easiest ways to provide roof ventilation. Lomanco’s Lo-Omni ridge is an excellent choice. One common mistake in attic insulation installation is to stuff the soffit with insulation. This effectively blocks the ventilation in the attic. 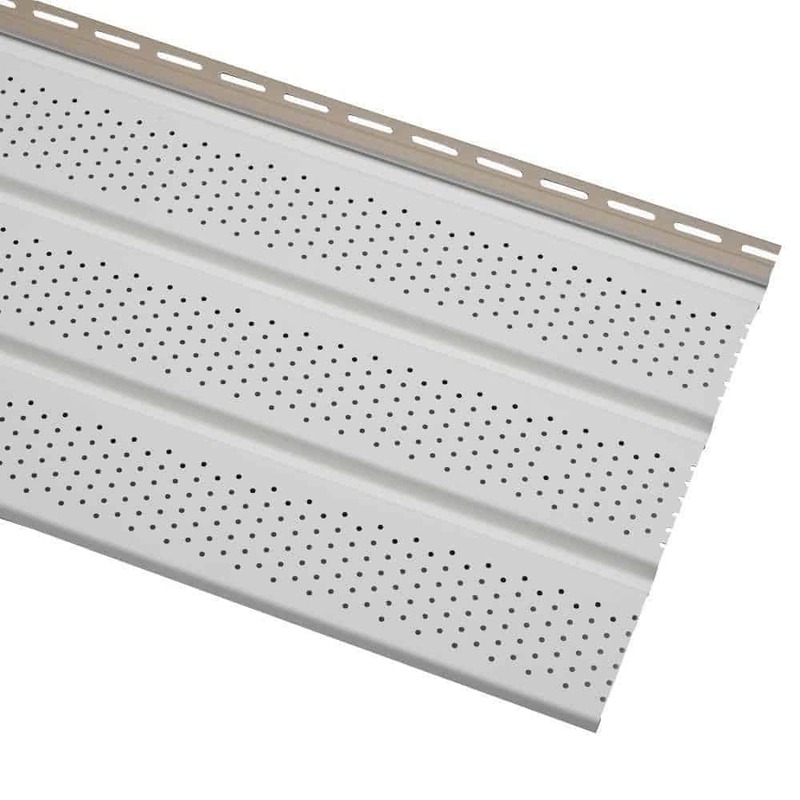 In order to keep the soffit clear and allow air to flow into the attic, install a baffle or chute. 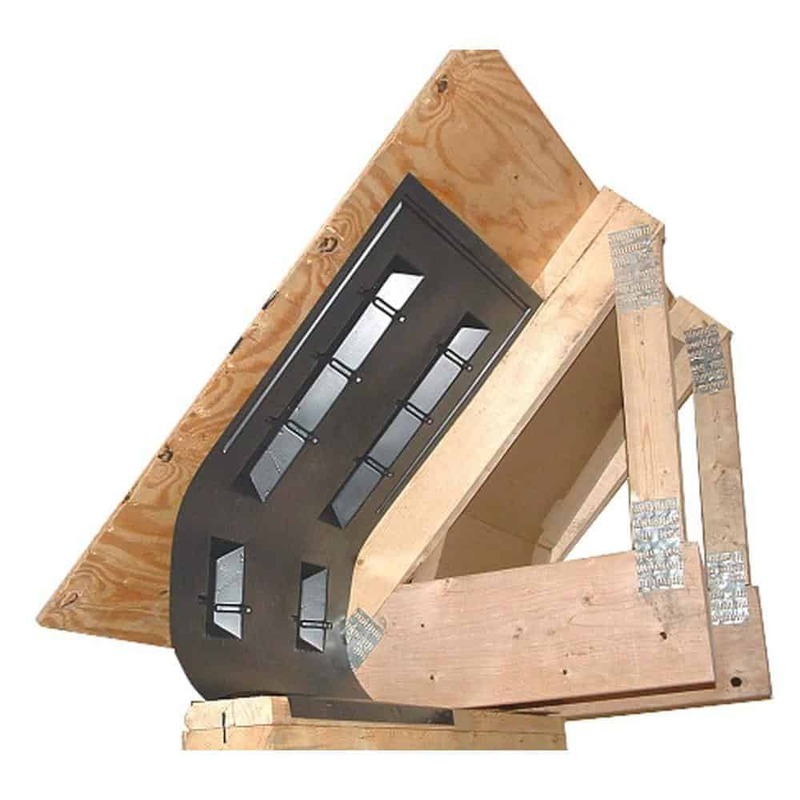 This Accuvent Vinyl Attic Airway and Soffit Vent is placed in each roof framing bay. The chute only needs to extend above the level of the insulation. I want to return to the idea that ventilation will prevent condensation and mold growth in an attic. While I agree with this idea, it’s just as important to limit the amount of moisture that enters the attic from the living spaces. Jeff Gordon, of the Building Research Council, ranks ventilation as the third most important factor in controlling attic moisture. A home’s interior humidity and the ceiling tightness, as well as air pressure have a greater impact. No amount of ventilation is going to make up for a poorly sealed attic. Now that the bathroom exhaust fans vent to the outside, we are monitoring the humidity levels in the attic. We plan on looking into sealing some of the ceiling penetrations, such as can lights in the kitchen. If you’re a homeowner, take a look at your attic’s ventilation. Check that vents are high and low. Check that insulation does not block the vents. If you’re planning a new home, check that the attic ventilation is correct. A little extra time doing it right now, will save a lot of trouble in the future.